Their king betrayed his subjects’ trust. Each refugee from stratospheric Interment has left for their own reason, but Morgan is shocked to discover Celeste’s motive and how far the princess will go to get what she wants. You can read Burning Kingdoms without the first book in the Internment Chronicles (as I did), but learning in detail what led Morgan and friends to escape that Perfect Ruin high in the sky would certainly enhance your immersion into this almost-our-1920s world. What would you give up to save those you loved? 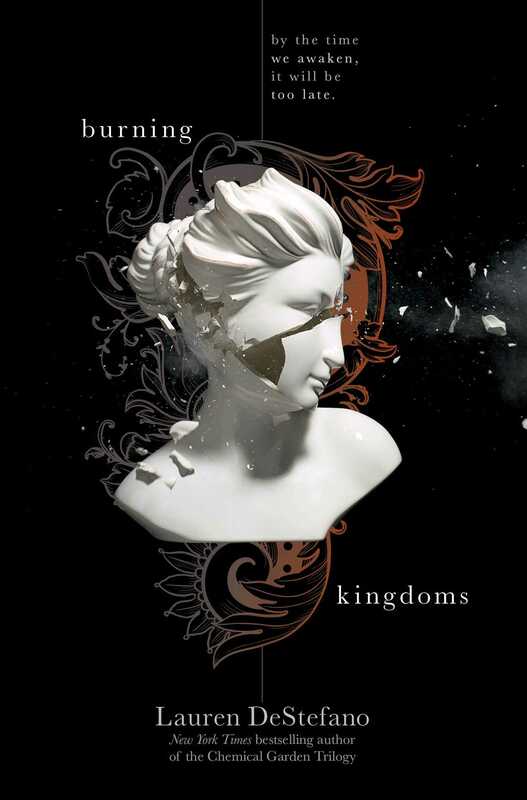 Book info: Burning Kingdoms (Internment Chronicles, book 2) / Lauren DeStefano. Simon & Schuster Books for Young Readers, 2015. [author site] [publisher site] Review copy and cover image courtesy of the publisher. My book talk: Fleeing their floating sky-island, Morgan and other young rebels find themselves grounded in Havelais whose king wants to use their knowledge to ramp up his war for rare resources, the same ones abundant on Internment. Morgan and her betrothed, her blinded brother, her best friend – they had to leave or be killed by the King. But why did the crown princess demand to come on this one-way journey? Snow falling from the sky, multiple children in one family, an amusement park just for glimpsing ‘the magic floating island’ -Havelais has many things that Morgan had never imagined, including aerial warfare with bombs from a neighboring kingdom. Housed at the amusement park hotel by the king’s advisor, only Morgan and Pen venture out regularly, sneaking into speakeasies and cinemas with Mr. Piper’s teenage daughter Birdie or riding in son Nimble’s beloved auto-mobile car, until the princess is granted an audience with the king and inadvertently gives Havelais a reason to travel to Internment at last. How can the princess believe the king will become an ally? Why does Morgan sometimes wish that her betrothed hadn’t stayed by her side? ← A for assassin in Seeker, by Arwen Elys Dayton (book review) – higher purpose or highest bidder? Interesting thati don’t know either of your first two choices! The U.S. and UK markets must be very different. I do try to find the lesser-known yet wonderful books for BooksYALove – the ‘big names’ get enough publicity already! Interestingly, some books that I loved came out in the UK long before they got to the US, Anabel – Holly Smale’s Geek Girl comes to mind. Quite intriguing. Thanks for bringing this series to my attention. I’m hooked!